Brother surprised me this summer with plant snips from one that was Mom’s last in the nursing home. She watered it with leftover coffee, cream and sugar and the thing still outlived her. He’d already named her Emma, same as our mother. Unknowingly, months before, I had scored the perfect stand for it—an uncanny sibling telepathy that happens between us—and he gave a simple, knowing nod when I unnecessarily explained wanting something green in that corner but had yet to find the hardy, sunshine-loving plant with the perfect drape. This is it, I thought when he opened one of his old cigar boxes (also mine to keep) to reveal the eight cuttings he had soaked in water for three days to coax roots from before traveling three thousand miles for the installation. My slow smile mirrored his and I went to fetch a bag of soil. We told “Mom” stories as he filled the girly polka-dotted turquoise teapot planter halfway with soil, and then tenderly kneaded each of the cuttings into place in a way that felt like a blessing. Live, live, live. He watered and waited, adding more dirt and thumbing each one down a little more, maybe nesting them in for life. I was hypnotized by my brother’s hands, almost twice the size of mine. Calluses and silver rings. Those strong football-throwing, deck-building, boxing hands that have always had a firm sense of first-born duty. His whole-hearted devotion to potting Emma made my heart swell. He always had the green thumb, coaxing life from seeds, pruning and doing triage on plants on the brink. Droopy flowers perk up at the sight of him. I have been the opposite of that except with succulents, spider varieties and a glossy nine-year old bush-like plant in the living room that has its own will. That he trusted me with Emma at all filled me with wonder, and while I was initially honored by the responsibility of keeping my mother’s namesake alive, the fear crept in. Until I remembered that she watered it with leftover coffee, cream and sugar, so I may have a shot. Emma is looking pretty healthy and I never knew plants like coffee, cream, and sugar. Thank you for sharing this story. 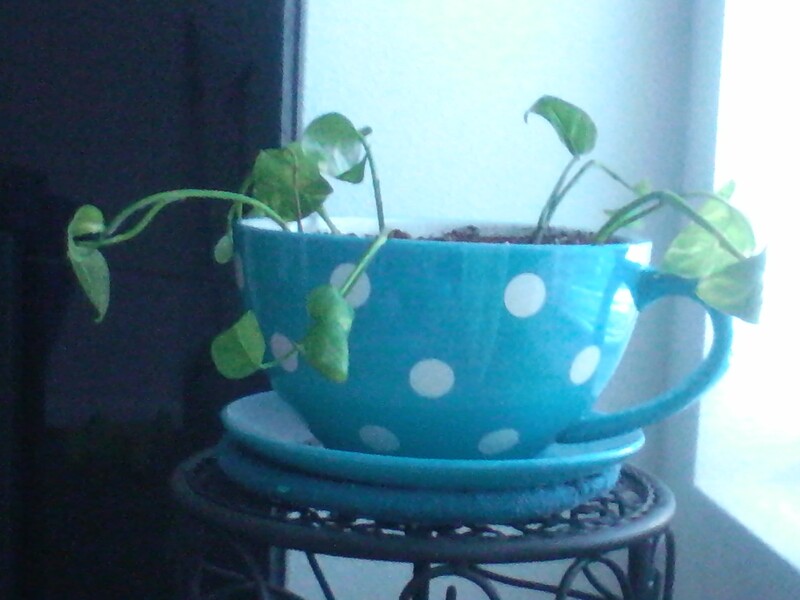 I love that the plant sustained with coffee is now in a coffee cup. And I love this post – poignant and sweet. Emma lives and Brother is coming next week to check on her! This was lovely. The fact that it survived with whatever your mom gave it is amazing. And how wonderful that you can now have your own coffee and sit beside it and watch it grow. It’s rather like a little bit of your mom watching over you. It’s a survivor alright. Still going strong! I don’t drink coffee, so it’s not even getting grounds. LOL. It’s in the kitchen though, near my tea stuff. And, yes, you’re right, I feel her watching over me most there. Beautiful remembrance of your Mom. Blessings.